Okay, seaoat, let's test out your theory about hurricane forecasting. Pensacola Discussion Forum » General Discussion » Okay, seaoat, let's test out your theory about hurricane forecasting. You say it's no better than randomly throwing darts at a dartboard. The NHC predicts two things. Where the hurricane will go and how intense it will be. Since intensity is the thing they're the weakest on, let's stick to that. This is the latest intensity forecast for Tropical Storm Fred (10 PM Central on 8/30). What we'll do is follow this thing and see how close they get it to being right. degenerating to a depression by the end of the period. the shear remaining strong, but the dart hit mid thigh on the donkey map. This should result in the cyclone degenerating to a depression by the end of the period. be underway by that time. Okay, the first prediction (the part in red) has come true. Tropical Storm Fred has now become Hurricane Fred. We'll now wait to see what happens with the 2nd part of the forecast (the part in blue). Freddie is dead........dart hit the donkey map in the ankle joint. stable air mass should cause a faster rate of decay after 36 hours. Three cat 4 hurricanes in Pacific.....they blew the forecast on Hawaii.....of course. 2seaoat wrote: Three cat 4 hurricanes in Pacific.....they blew the forecast on Hawaii.....of course. That would be Hurricane Ignacio. How did they "blow" the forecast? So let's emulate bds and present just the facts, maam. Here's what you're referring to. 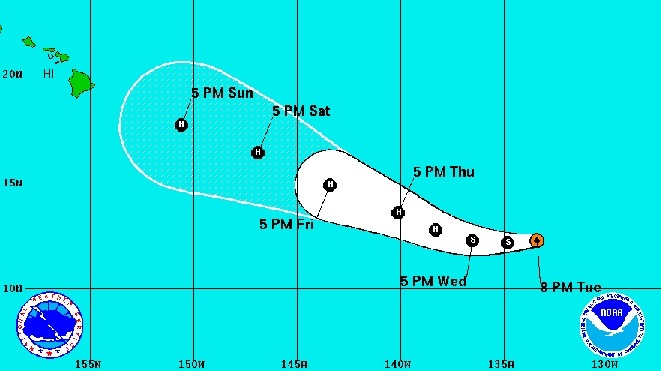 This is the track forecast when Ignacio was about six days away from landfall (had it struck the big island). 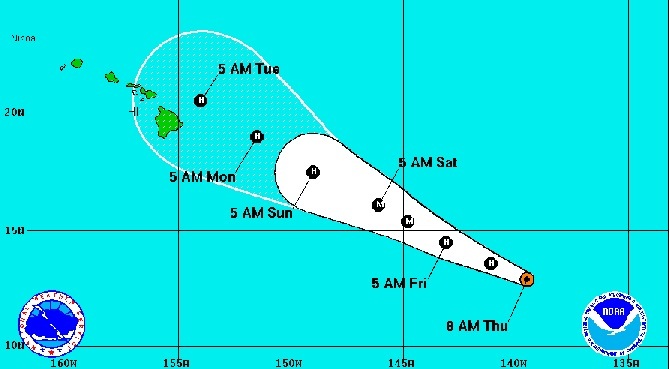 As you can see, the forecast puts the center of the cone through the big island making for a direct hit. And as you point out, the hurricane actually went a little northward of that forecast track and missed Hawaii. Now, here's the forecast when the hurricane was about 5 days out. Unlike the six-day out forecast, the center track for that forecast IS exactly where the center of the hurricane eventually went. Here's what you're overlooking, seaoat. The NHC doesn't put out 6-day track forecasts and doesn't do it intentionally. Why? Because the NHC itself tells us the margin of error is too great before 5 days out. That's why they stick to 3-day and 5-day forecasts. And the particular storm you referred to proves them to be wise in making that decision when we see the 5 day out forecast and all the ones after that proved to be right on the money. So the moral to that story is, don't start panicking if that center line goes through Pensacola when the storm is still 6 days out. And neither would a Hawaiian do that either if he had any sense. Donkey ear on Hawaii......dart missed. 2seaoat wrote: Donkey ear on Hawaii......dart missed. I am sorry....I thought I gave a Bob response.....lol. Seaoat: "What you don't understand is, President Obama has decreased the deficit from $480 billion last year to $420 billion this year and we lifelong republicans are celebrating that". Bob: "Darts and donkey ears". I do miss him. He was always fun. What a loss. 2seaoat wrote: I do miss him. He was always fun. What a loss. AMEN COUNT ME MISSING HIM AS WELL!! Add my name to the list of those who miss good ol' Bob. He was a peach and half. Because the NHC itself tells us the margin of error is too great before 5 days out. That's why they stick to 3-day and 5-day forecasts. Error is too great........thank you for the obvious........every dart thrower knows the same. Who gets F'd and dies this time? 24 Re: Okay, seaoat, let's test out your theory about hurricane forecasting.